In “Saviour?” the lawyer Michael Jamal Williams III, played by Parrish Morgan, repeatedly pulls out a tape recorder. Regardless of whether anyone else is present, he records a note to self and an accompanying “note to black self.” The tactic is sometimes a source of comic relief, as Williams switches seamlessly between formal diction and blunt, expletive-laden language. Like so much of the play, however, it hints at a deeper truth. It’s a powerful reminder of the plurality of identity and the complex ways that the parts of a person’s life intertwine. 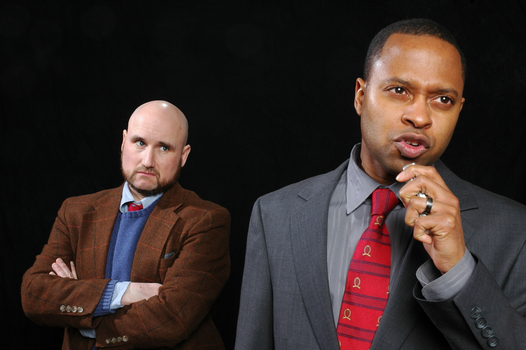 Identity figures prominently in Esther Armah’s two-man play, coming up time and again as Williams, an African-American lawyer, questions his white client, Billy Hall (Keith Cavanaugh). Hall is suing the antiracism nonprofit he worked for, alleging that he was passed over on the basis of his race for the position of CEO in favor of a African-American woman. But while Williams deliberately and carefully plays with the separation between different facets of his life, Hall, it quickly becomes clear, sees his life as a single coherent narrative, and sees himself, he says, as “one of the good guys.” He may acknowledge the irony of himself, an antiracism activist crying reverse discrimination, but he considers that fact irrelevant to his case. He declares, “The whole white privilege thing? It’s just not me,” almost in the same breath as he says he was sure he’d get the job. In Hall’s eyes, he’s locked in a fight for what’s right, a fight on which his entire career depends. It’s not immediately apparent whether Hall’s suit has merit, but what is certain is that Williams has just as much on the line in this case as his client. Morgan brings out that fire nicely, giving Williams an understated intensity as he spars with Hall, by turns interrogating him and egging him on. Their conversation spreads beyond the immediate facts of Hall’s case to touch on questions of marriage, ethics, and justice itself. In the process, their bold assertions about what’s right, wrong, or true, and their skepticism about each other’s words, build distinctions between the men and their polished personas. While this brings out nuance in the portrait of Williams, Hall veers off into caricature. He tosses off comments that have us questioning how he could possibly have succeeded as an antiracism activist, referring to one woman as “fragile, like a lot of black women—like a lot of black people.” And as he condemns apparent hypocrisies with a self-righteousness that quickly becomes characteristic, this avowed liberal reveals himself as just another white male with a superiority complex, and one with few redeeming qualities at that. Cavanaugh’s portrayal, though possessed of a tense energy that helps drive the show, never quite seems to raise his character to the level of full human being. His Hall pouts, whines, and sneers, but does so somewhat mechanically, with conviction but without real feeling. The descent of the supposedly enlightened Hall into the stereotype he insists he doesn’t fit is the core of Armah’s incisive, sardonic commentary on post-Obama race relations (at one point, Hall notes, “God, I thought Obama’s election was supposed to make this all go away”). Still, it also undercuts the play’s exploration of identity by reducing Hall to a villain. On the whole, however, “Saviour?” shuns easy answers. It shows that the administration of justice is not immune to entanglement with questions of identity and perception.